Be the first to share your favorite memory, photo or story of Ronnie "Moose". This memorial page is dedicated for family, friends and future generations to celebrate the life of their loved one. 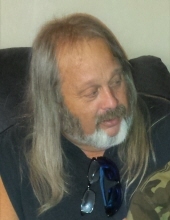 Ronnie “Moose” Barwick, 59, passed away at his home in Seven Springs, NC. Known as “Moose” to his friends, to his family he was Ronnie. Ronnie was a lifelong resident of Wayne County, NC. He was born March 19, 1960, in Wayne Co, the eldest child of Ronald Ben and Shealvy Taylor Barwick, both of whom preceded him in death. Ronnie enjoyed the sport of softball almost as much as brushing his hair (he loved his long hair). He spent many of his weekends participating in softball tournaments. He was a pivotal figure in the game when our Mom was hit in the mouth with a powerful outfield to home plate throw, by Ronnie. Ronnie loved his sleeveless shirts and watching old western movies (almost as much as brushing his hair). He also enjoyed spending time with his son, his brothers and sisters, niece and nephews, numerous cousins and a host of friends. Our family dinners will have one more open seat. One less place setting but a lot more food to go around-the man loved to eat! It is our hope that when you read this that it makes you smile. Our family is not known to be conventional- dysfunctional, yes, but never conventional. Ronnie would expect this and wouldn’t have it any other way. Ronnie “Moose" Barwick will be missed by many, especially those people who have spent a lifetime knowing him. We love you Brother. Rest in peace. Ronnie is survived by a son, Cameron Dakota Blizzard of Duplin County; two sisters, Lori Ann Quinn of Seven Springs, and Phyllis Ann Ryan and husband, Andrew, of Goldsboro; three brothers, Randy Barwick of Seven Springs, Dennis Barwick and wife, Ramie, of Bentonville, and Ricky Barwick of Pikeville; and their families. To send flowers or a remembrance gift to the family of Ronnie "Moose" Barwick, please visit our Tribute Store. "Email Address" would like to share the life celebration of Ronnie "Moose" Barwick. Click on the "link" to go to share a favorite memory or leave a condolence message for the family.